I am Joy from Lunches + Littles and in case you missed Kelly’s recent announcement over on Instagram, we are teaming up in order to bring you even more, colorful, flavorful recipes each month (and I am so excited)! I am a busy Mama of three little ones (ages 2, 3 and 4), and as you can probably imagine, life can get a bit hectic at times. 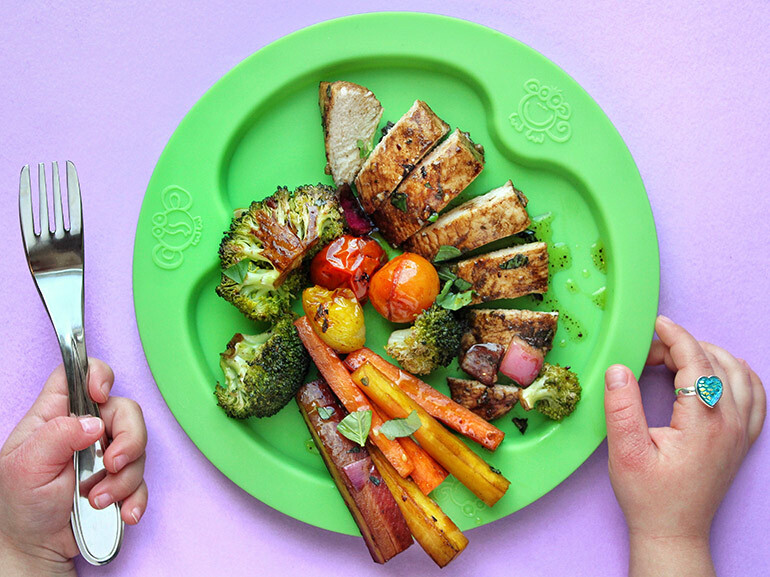 That is why I work hard over at @lunchesandlittles to develop recipes that are doable for real life, all while being kid-friendly, healthy and full of color. I am a huge believer that we (especially our little ones) all eat with our eyes first. 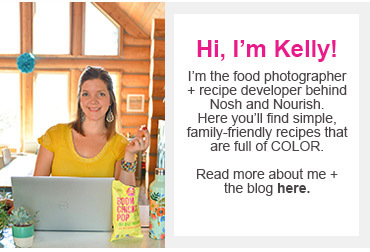 Showcasing color and fun as part of a healthy dish is very important to me (and Kelly! ), and I am so excited to be able to share some of my creations here with you in the coming months. 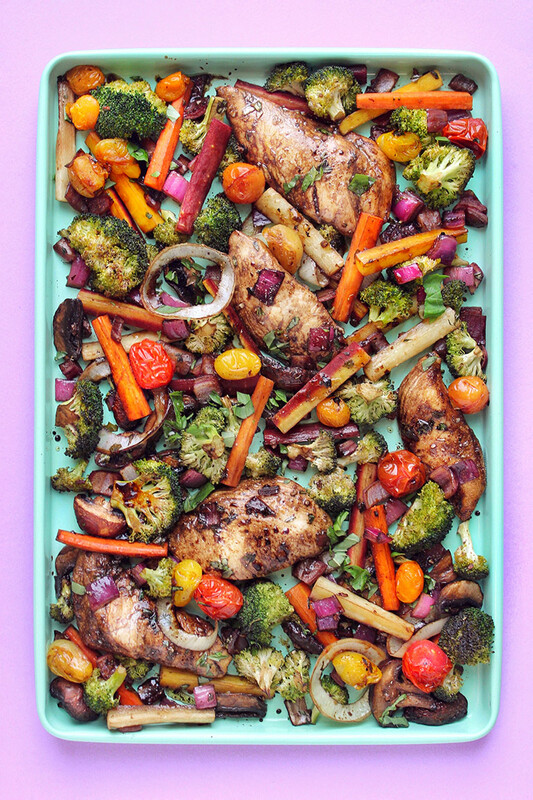 I am obsessed with a good sheet pan dinner. There’s just something about chopping, arranging and roasting everything together on one pan that I love. Well, maybe a few things I love, because of course in addition to the meal itself I love the easy clean-up that goes along with these kinds of dinners. They just make mom life so much easier, and we all need some easy nights now and then. This dish is so fresh and flavorful, and quick enough to throw together any night of the week. And this recipe is one so many can enjoy because it is Whole30 compliant, grain-free, gluten-free and dairy-free. • This is a recipe where the longer you can marinate, the more flavorful you will find the dish overall. I usually marinate my chicken for at least 2 hours, but you could even leave it overnight. No matter what, just make sure to marinate for at least 30 minutes. • To throw this meal together even faster, chop and prep your produce ahead of time. Even though this is a quick meal, it can be even quicker on a busy night by simply prepping the produce ahead of time. Then, when it is time to put it in the oven, literally all you will have to do is throw all your prepped produce and marinated chicken on a pan. • Make it your own – if you have little ones that may not like mushrooms, or another veggie that is part of this recipe, substitute something else in it’s place. Don’t stress about having to include everything you see here. This recipe is an easy one to modify. For more delicious recipes that are as colorful as they are easy to make, check out @lunchesandlittles! 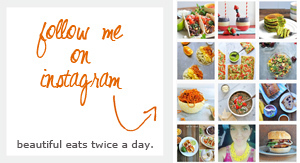 I can’t wait to share my next recipe with you! • Start off by making your marinade. Combine balsamic vinegar, oil, garlic, basil, thyme and honey (if using) in a small bowl and whisk to combine. Add salt and pepper to taste. Then set aside. • Once chicken is trimmed and cut (if necessary) place in a large resealable bag and add about 1/2 of the marinade to the bag. Then, seal the bag and give it a good shake – moving the chicken around in the bag so that each piece get coated with the marinade. Lay bag flat in the refrigerator and allow to marinade for at least 2 hours. *Depending on size of bags, you may need to do two and split chicken/ marinade between them. • Once you are getting ready to cook-time: Pre-heat your oven to 400 degrees and either line a baking sheet (or two) with parchment paper or spray pan(s) with non-stick cooking spray. *I don’t like to overcrowd my veggies, so typically use two pans if making a large meal like this, and then transfer everything to one single pan prior to serving. • While chicken is marinating/ prior to cooking, prep all your vegetables except tomatoes (see below) – cut broccoli, peel and cut carrots, slice/ chop mushrooms and dice onion. Once prepped, place all veggies on your sheet pan(s) and pour remaining marinade over the veggies; tossing to coat. *You do not have to use all of the marinade. If you think it is too much, just use as much as you would like on the veggies. Discard the remainder or serve on the side with the finished meal. 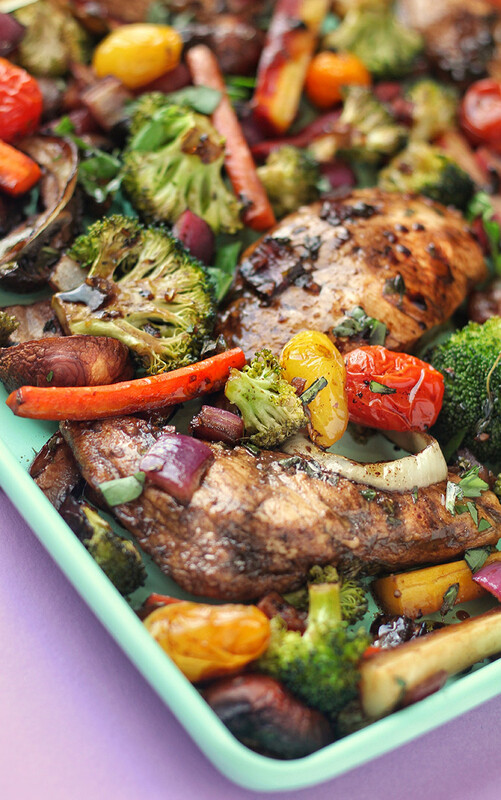 • Remove chicken from resealable bag(s) and add to your sheet pan(s), alongside the veggies. • Next, place pan(s) in oven and bake for 10 minutes. After 10 minutes, remove pan(s) from oven and scatter your cherry tomatoes throughout the pan(s). Return to oven. • Continue cooking for an additional 8-10 minutes, or until chicken is cooked through. • Once everything is all cooked through and ready, remove pan(s) from oven and top with fresh basil (chopped) before serving.